Why Buy Your Grease Filters From Flue Steam | Flue Steam Inc.
Buy your grease filters from your kitchen air control specialist for superior protection. At Flue Steam, we offer a complete range of kitchen air control and fire suppression services to help protect your commercial kitchen from the risk of a fire. Selling quality grease filters is an important part of this effort. Here are some of the benefits of buying your grease filters from us. By installing the right type of grease filter and keeping it in good condition, you can capture up to 80 percent of the grease that would otherwise make its way into your air ducts, without compromising the efficiency of your kitchen air control equipment. Naturally you want to select the best filters, but you may not be an expert in this area or have time to learn all the details yourself. Fortunately, at Flue Steam we have over 40 years of experience and we know grease filters. We can help you select the right filters that meet your needs for cleanliness, efficiency, and cost. When you shop with Flue Steam, you never waste your time considering inferior products. Instead, you choose from grease filters made by the two top-quality brands we carry, Kason and Flame Gard. We carry most sizes and models, including options made from stainless steel, galvanized steel, and aluminum. Stainless steel provides maximum protection against rust and corrosion in heavy-duty commercial applications, but if your operation does not produce that much grease galvanized steel may also provide sufficient protection. Aluminum is the lightest material and offers easy handling. 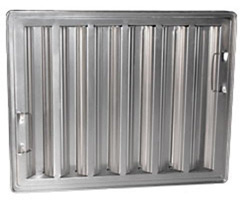 No matter which material you choose we typically recommend a baffle construction instead of mesh to increase both air flow and grease extraction. Perhaps the most compelling reason to buy your grease filters from us is that we offer a very convenient grease filter exchange service. We’ll work with you to set up a schedule for changing out your grease filters at preset intervals so you can always have clean, efficient filters in your kitchen. In most cases, this means you will get a visit from a skilled professional every two weeks, to haul off your dirty filters for cleaning and replace them with new ones. Don’t forget, we buy our filters in bulk direct from the manufacturer so we get a better price. We pass these savings on to you with discounts off the regular price for a single filter.